The tool effectively convert contacts from excel to vCard format and supports the conversion of both Excel files i.e. .xls and its advanced version .XLSX. It enables previewing all contacts before exporting to the output format. The software allows transporting the empty email address field to vCard and supports to save all the contacts in single .vcf file. For this, you will have to enable the feature; by default it stores contacts in separate VCF files. Excel Contacts to vCard Converter enables in the storing of the contacts under the same field as that of the Excel fields using the mapping feature. The fields of Excel and vCard can be mapped and added to the list and thereafter can export contacts. Once the conversion of excel contacts to vCard format is performed, options expanded to import the files to either of these applications; MS Outlook, Android phones, iPhones, Blackberry, etc. and store the contacts in the machine for future use. The tool has the provision to allow the users to export excel contacts to vCard format by supporting its versions; 2.1, 3.0 and 4.0. This benefits in the saving of output file in required format.It makes the software more interesting and efficient application. The software is provided with the feature which enables the users to view the conversion process status and also shows how much contacts are been added for conversion as well as the number of empty email contacts transferred while exporting. What Makes The Tool Outstanding? How much contacts can be exported to vCard? There is no limitation to the number of contacts that it exports. You can convert contacts from excel to vcard as many as you want. For the exporting vCard to Outlook do we need Outlook in the system? 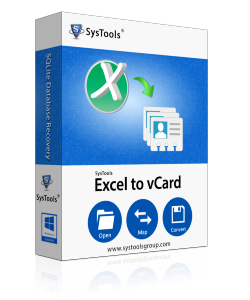 The software converts the Excel contacts to vCard file only. You cannot directly export the file to Outlook. Instead, you can import the file to Outlook from the stored location. Outlook configuration is not necessary. To which all devices can I import the VCF files? The software supports the importing of the vCard files to several email applications and devices such as; iPhones, Outlook, Android phones, etc. Can I store the contacts in single vCard file? Yes, by enabling the feature provided by the software you can convert the contacts to single VCF file. Which all versions of Windows does the software support? The tool supports all the versions of windows from 8.1 and below.